Pumps failing through running dry is not an uncommon problem but one that can be eliminated by using Hydra-Cell seal-less pumps from Wanner. All pumps with dynamic seals could fall foul of the dry running problem. The liquids that these pumps move also act as the lubricant and cooling system for the pump. 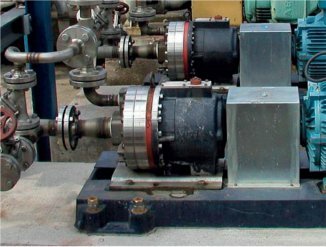 Friction of the mechanical seal faces running together without lubrication or the shaft packing running against the shaft without cooling by liquid seepage causes overheating, seizure and catastrophic failure. Hydra-Cell high pressure pumps are different. They operate with hydraulically balanced diaphragms and therefore have no dynamic seals to overheat and fail during dry running. Wanner claims that Hydra-Cell pumps can run dry indefinitely without problem. Hydra-Cell's seal-less design also enables them to pump liquids that contain abrasive particles and other non-lubricating fluids that would cause damage to pumps with mechanical seals.